Today's progressive companies see the need to develop leadership skills in tomorrow's potential leaders. They teach people strategic practices and developmental opportunities leading toward formal leadership training programs. Additional benefits from these global giants include analytical thinking and top levels skills that were once only available to senior managers. 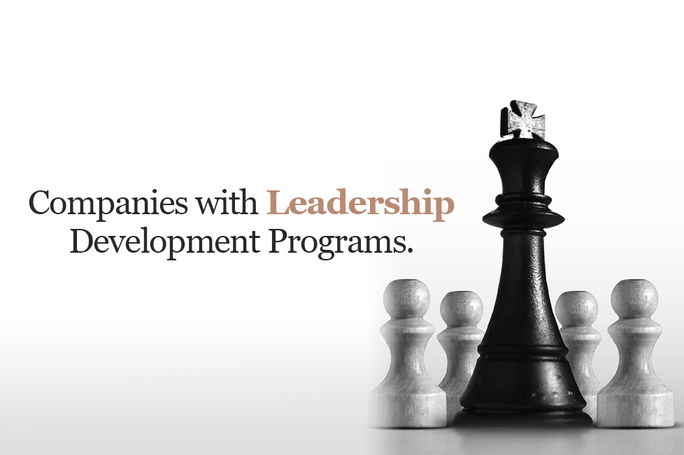 Johnson & Johnson provides varying levels of leadership development programs consisting of their global presence, which includes the finance, global operations, human resources, international recruitment, IT development, and procurement. For specific internal leadership programs, they provide training and leadership in the field of marketing, commercial ventures, the retail environment, developing business trends and forecasts, and regulatory affairs. Raytheon has developed a two year rotational leadership development program for short term work assignments. Applicants are supported by mentors and managers, especially during their 12 month work assignments. Their training is introduced through subject fields that include functional specific development sessions, cross-functional leadership development sessions, business/technology and leadership skills training. Additional learning techniques include video sessions and forums, corporate libraries and eLearning. McDonald is directing its leadership developmental program to all levels, of its organizational employees. Their goal under the program is to develop leadership and management skills that contributes to learning, growth, and competency building, as their employees move through their career paths. McDonald's program, is structured for employees to create a career path, understand their options, to know themselves in various business decisions, to continually learn and develop, as well as learning how to network effectively with others. College freshmen, sophomores and juniors are invited to Nestles USA leadership development symposiums which are held annually at its California headquarters. The symposium is a four day intensive business program which provides minority undergraduates the environment to be mentored and guided by the Nestle executive leadership team. The courses covered, include customized leadership development and community volunteerism. Telefónica, through their leadership development program, train their employees to be responsible for their own development, through mentoring. Telefonica's training programs are adaptable to all business needs and the needs of each individual, based on their annual “Competence Evaluation Process.” eLeaning tools are encouraged to be used by employees where financial solutions are studied, English and Information, Communication, Technology. Wal-Mart's Leadership Academy was created to develop managers and leaders before this level of maanagement became scarce. The Academy cultivates highly trained managers from the inside. The Academy develops program, where employees are trained through a series of developmental, training, and inspirational experiences to see themselves as leaders. It is a four month intense course consisting of virtual classrooms, master classes, instructor-led practice events, group discussions, and on the job experience. Its themes involve communication, leadership, international scoping and global thinking. The Coca-Cola Company offers the University Talent Program, for its interns. This leadership program offers up to 10 week paid internships in the field of Information Technologies, Public Affairs, Supply Chain, Sales, Marketing, Finance, and Human Resources. Also, for their full time employees, this same program gives its employees a 2 year advanced course in business leadership, financial solutions, human resources, sales, and product supply leadership. General Electric's (“GE”) leadership developmental program provides courses for its experienced employees and entry level employees. The program is designed to be rotational where participants gain exceptional experience and contacts within the walls of GE, through 8 month rotational assignments. GE's leadership program is an extensive peer network, where employees are paired with senior leaders, who provide global networking experience and mentoring opportunities for an accelerated professional developmental training. Citigroup designed a leadership program that diversified its training. In addition to training innovative banking solutions, they also include training for IT experts, international languages, software engineering, business analysts, and consumer technology, just to name a few. Citigroup is an extremely diversified global giant which supports women, working parents, the disabled, the military vets, cultural differences, and Pride. Citigroup provides customized training sessions for leadership roles, which includes mentoring programs. Posted in Teamwork, Tips on January 18, 2014 by belsan.